Browse:Home Kurier Wileński To Šalčininkai for a carnival! These are the last days of the annual carnival. 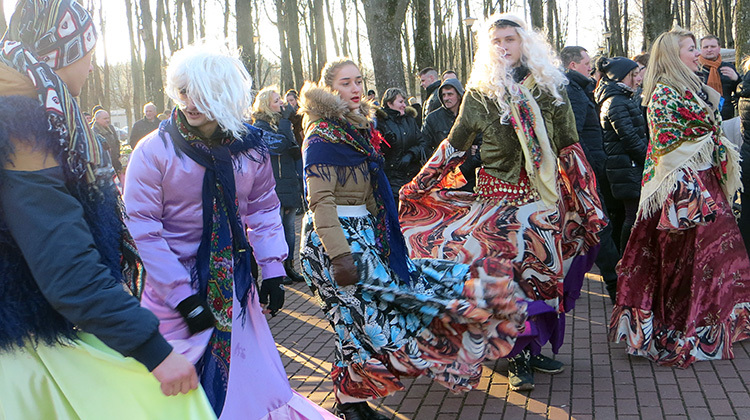 For this reason, on the 7th February, on the last Sunday preceding Ash Wednesday, the annual carnival was held in the city park in Šalčininkai. It was cheerful and rich – just as a carnival should be! You could take a bite of a hot blin straight from the frying pan, warm yourself up drinking hot wine from a kettle, taste a donut, delight in all varieties of meat specialties, and dance with masqueraders to the lively music coming from the stage. The festival, co-organized by the Cultural Center and the local government of the Šalčininkai region, has been in the calendar of traditional regional events for many years. The carnival is very popular, both the eldest and the youngest inhabitants of Šalčininkai and its surroundings take part in it. The event organizers arranged funny traditional carnival games, which everyone present was invited to join. You could take a part in a game with a broom, in which dancing couples had to choose a new dance partner when the music stopped. The one who did not manage to do so, remained with the broom. A few volunteers, including Baba Yaga, took part in a game which was about hitting one another with sacks. Another dancing game „Jawor, jawor” also brought its participants a lot of joy. A big surprise – also for the organizers – was the unexpected visit of a brown, friendly bear, which danced, joked with people, and even… invited the mayor to dance. The numerous audience had a lot of fun to the accompaniment of various bands. The guests of the festival were welcomed by the hosts – the choir and the band of „Solczanie” song and dance ensemble. On the Šalčininkai stage we could listen to guest performers from abroad: „Cymes” band from Bialystok and a folk group „Kupalinka” from Minsk. We could not miss Lithuanian folk elements: one of the performers was a Lithuanian folk band „Daumantų muzikantai” from the Kėdainiai region. During the festival, the results of „the best carnival mask” contest were announced. The contest participants had previously taken part in the workshops on how to make a carnival mask in the papier-mâché technique and then hand-painted them. You could vote for the photos of the masks which were posted on a website, and the most artistic ones were granted an award. After having counted the votes of the commission and „likes” on Facebook, the following masks were recognized as the most artistic: Emilia Kasparovičiūtė (8 years old) – 1st place, Alantė Kraujutytė (6 years old) – 2nd place, Donata Kisielewska (5 years old) — 3rd place. There was also a handicraft market, where everyone could pick and choose attractive artistic ornaments. There were clay plates, fabulously colorful felt house slippers, artistic bird feeders, hats, scarves and gloves for the last winter days, baskets, and many more items, in a word, something special for everyone. One could also take a bite of various appetizing delectables: blini with maczanka, sausages, donuts and other delicacies. At the end of the festival, in accordance with tradition, a straw effigy Marzanna was burnt. This symbolic rite towards the end of winter reminds that spring is just around the corner and that this „crazy carnival time” will soon change into the period of quietness and waiting for Easter to come.